Would You Take a 'Spin Bus' to Work? Squeezing in that morning workout before you begin your commute to the office can feel like riding the struggle bus. But thanks to one fitness studio, Londoners may soon be able to combine both with a spin studio on a *literal* bus. 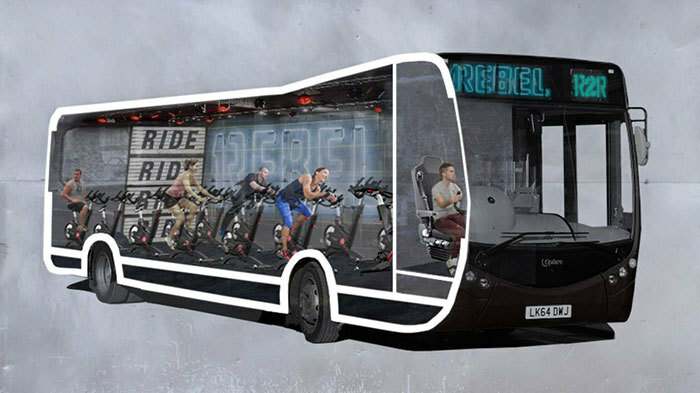 British boutique fitness company 1Rebel has announced plans to transform a bus into a mobile spinning studio, so you can make the most of your commute with a 45-minute high-intensity workout. Classes are reported to run around $20 (transportation included!). "It is an absolute no-brainer for us that we can create more efficiency in people's routines by transforming their commute," 1Rebel founder James Balfour told the Evening Standard. "For those who want the components of a class, but perhaps don't have the time to commit during the day, this provides a great solution for them to maximize time they would otherwise be spending just traveling to work." Seriously, why hadn't anyone thought of this idea sooner?! While 1Rebel hasn't yet received approval from the government to move forward, if they receive the go-ahead, the bus could launch as early as this fall.